Here we go again. 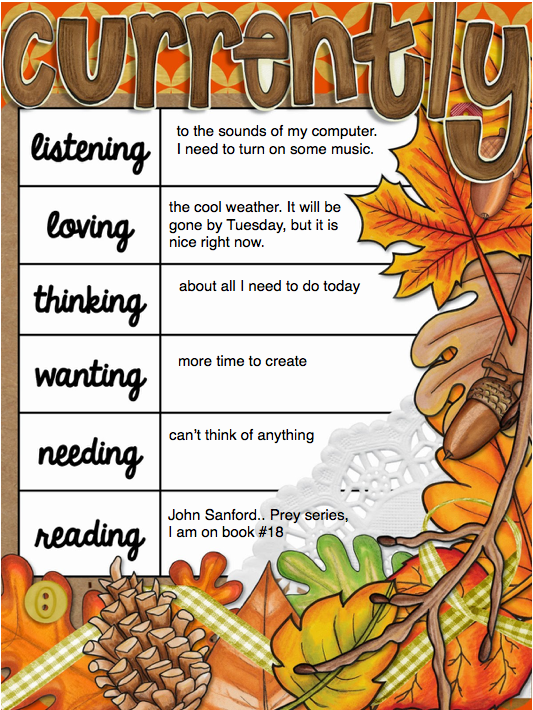 A new month, a new Currently post, hosted by Farley at Oh' Boy 4th Grade. At this moment I am listening to the quiet hum of my computer. It is early and I haven't turned on the music yet. My current ear worm is Benedictus by 2 Cellos. Check out their You Tube page. Fantastic music. The cool weather here in south Florida. This weekend has been perfect, cool mornings, highs in the low 70s, great weather to sit on the porch with a good book (see reading) and a mug of hot green tea. Relaxation shall commence! More time to create! It is hard during the school year. I am a scrapbooker, card maker, learning to paint kind of gal. Not to mention creating items for TPT. Hubby & I are reading the John Sanford Prey series. We read a couple last year and enjoyed them. I am on book #18. We will have to buy the latest soon. He has moved on to the Virgil Flowers series. I have a James Patterson book from the library I need to read this week. Who knew my "Reading" section would be the longest. Thanks for stopping by. 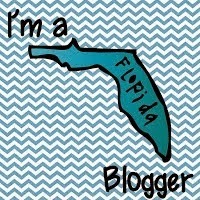 Don't forget to stop by Oh' Boy 4th Grade and check out other teacher bloggers are Currently doing. Have a great November. Hi! Haven't heard of that book series but I'm always looking for good new reads! Can't go wrong with a Patterson either-he's great! I'm jealous of your weather. Up in CT it's a little brisk outside, windy, and grey. Enjoy every porch-reading-tea-sipping-minute! It is hard to squeeze in crafty time after school. All your creative energy is used up during the day with the kiddos. Yay for weekends! Hi! I'm in the Bahamas so we are enjoying similar weather! We are also enjoying the cooler temps. So nice! We were in Seattle before moving here so we love the temps being in the 70s now. I'm going to check out that series of books. Always looking for a new series! Also going to check out your music recommendation. Come visit Michigan...it snowed on Halloween. :) I'm going to check out that peaceful music!